It’s been a banner year for the Grand Haven Lighthouse Conservancy, and the group taking charge in preserving the city’s two lighthouses is taking that literally. The Grand Haven Main Street Downtown Development Authority is planning a fundraiser for the conservancy’s efforts in the form of banners hanging from the city’s downtown streetlights. “We are going to put up the banners from Memorial Day to just after Labor Day,” City Manager Pat McGinnis said. The Downtown Development Authority will be selling the banners. Sponsors are asked to make a $300 contribution to the lighthouse preservation effort to participate. The name of the sponsor’s organization or business will be placed on the banner. “It’s really unique, because we have a strict ordinance about advertising,” McGinnis said. At the end of summer, the banners will be delivered to the sponsoring business or organization for their own use. McGinnis said the images on the banners came from members of the community who participated in the city’s calendar contest. “We went through the photos and chose four favorite ones,” he said. 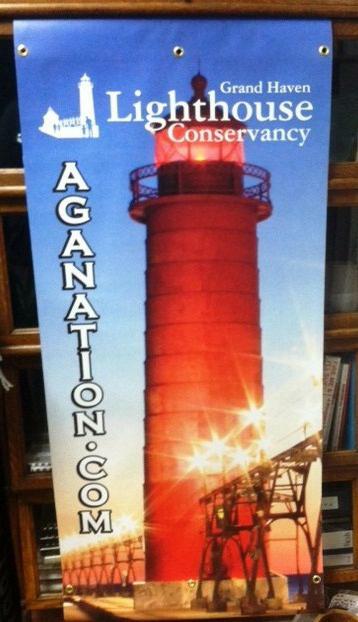 All proceeds will be donated to the Grand Haven Lighthouse Conservancy for the 2013 preservation project. The city officially took ownership of the lighthouses earlier this year. Marci Cisneros, the conservancy’s vice president, said the community has supported their efforts through several fundraisers — such as a brick project at the pier and the recent Run for the Lights event.